Together with my wife we are already in a project for an Expedition Truck with a Man Kat. We are looking for a 1990s generation truck but we have not decide between a 6x6 or 8x8 chassis... so some advices will be very appreciated!!! Also we will be going up to 12 meters long and we like to go to really isolated places and beaches. The manufacturer advice us to go for the 6x6 because there will be more space to install more diesel tanks as well as the mechanic should be more easy than a 8x8, also that the diesel consumption is higher in an 8x8 than in a 6x6. Thank you very much and we will appreciate your comments and advices!!! which is a forum around the particular manufacturer of high-mobility trucks - with less emphasis on the plus and minus of long distance travel cabins. As always, the more you are able to share what your (and your wifes) intentions are, the better we are able to comment on your asks. 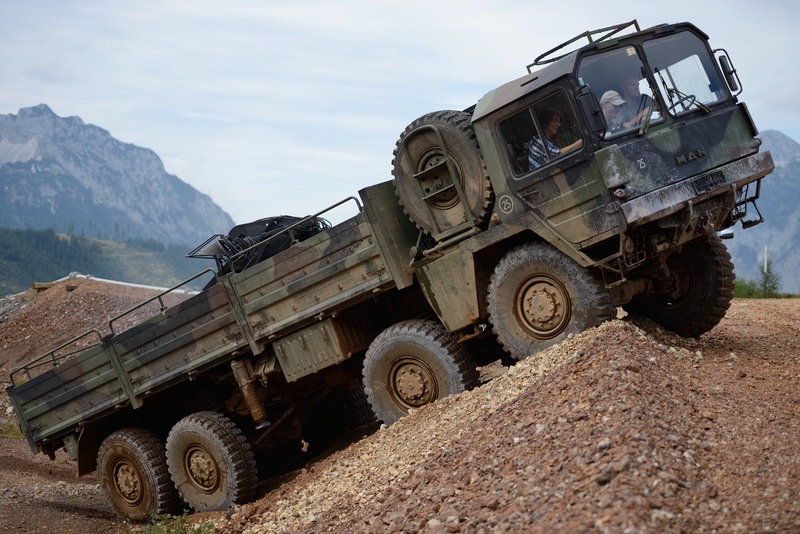 Neither a 6x6 or 8x8 will be easy to retrofit to a 12 meter long expedition truck. The truck is 10,5m long by itself, and unless you intend to add 1,5m behind the last axle, you have to give up some length. Adding your requirement of significant off-road capabilities, a 1,5m rear extension might not be recommended. The KAT 1 was built between 1977 and 1981, the successor KAT A1 from 1989 until 1992 - your choice. Cheaper and more spare parts are available for the KAT 1, a bit more modern (= oriented towards travelling) is the A1. The front cabin takes about 3 meters, due to the engine behind the drives cabin. Need to be considered when planing your cabin. It is possible, bt not easy to connect the travelcabin with the drivers cabin in the front, but then the spare tyre need to be somewhere else. I plan to do exactly the same as you and I tortured myself for a very long time (almost 2 years) with the same question. But in my case the main reason for this long peroid of time is that the 6x6 looks so cool. If you are weighing arguments and facts than the decission is (IMHO) merely between the 4x4 and the 8x8. The 4x4 is lighter, cheaper to drive and maybe easier on tiny roads. The 8x8 has its advantages in livingspace and on soft ground - simply due to the less ground pressure per wheel and it rides smoother and calmer on bad roads and offroad because of its double axels. In the end I went for the 8x8 because if you talk difficult offroad conditions it is mostly because of soft ground or big holes On hard ground many vehicles are able to make their ways. And...with an 8x8 you get a good starter pack: bike up with crane, shelter up with crane and off you go! attached a picture of my actual constellation Kat 1 8x8 with FM2. 88cm longer than original. Meaning it is 11m long. I was long tempted to go for the newer cars as they are more comfortable...more powerful... but in the end I bought the old one. The reason is that it is no rocket science to repair for an office nerd like me and spare parts are available. by the way... if you go for the long wheelbase 6x6 - the agility advantage of the 6x6 over the 8x8 is further diminished! Sure, my name is Augusto! First, thank you for your advice and comments... in deed the manufacturer until now would be GekkoTruck, and my wife and I wanted the 8x8 but by some advices we decided to go for the 6x6 because there will be more space between the axles for diesel tanks, etc., as well as as to deal with less mechanical possible issues so.. even when my dream is and will be the 8x8 I agree that the 6x6 is better for us right now. We want to go up to 12m because we will be living-traveling & working there... we are fully active but thanks to our work we can do it all in the expedition truck so we prefer to have the maximum. The better we guess will be the early Man Kat A1, apparently there are spare parts easely, and surely as you said more expensive but the truck also will have 10 years less then the first generation! Thank you again and any other comment will be highly appreciated!!! Thanks for the comments,,, yes you are right... the discussion about 6x6 vs 8x8 is just infinite and both are just great! Of course the 8x8 is for sure the king of all off-road, but we need to think as well in independence about traveling long distances vs the diesel consumption, but most information I saw more I know that there are fuel stations available closer and closer in most countries. We really want to go to isolated places, not the kind of cities or old towns, we are looking the very wild experience! Well... I also said, okay if won't go for the 8x8 then I prefer the 4x4 but the length of the wheel base and the off-road capability decrease too, so in the middle I guess would be okay. Your truck seems great already with the living box and the motorcycle... nice purchase! I guess we know already all the vendors about Man Kats in Europe and we are waiting for the answer from Swinkels Trucks, since they have nice trucks and the manufacturer is a friend of them. Just two weeks ago we almost bought a truck 1999 but apparently there are no spare parts for the suspension system and the conversion to receive the living box would be costing around 40,000 euros so of course, we decided not to buy it! I will be posting more!!! Ralph... I forgot, the video is great, I guess the truck is from a seller in the UK, it looks great. Look this video is just amazing https://youtu.be/kbqA1Jzwi98. This is power! Great if the two of you have the flexibility to be active anywhere globally in your respective professions. There are 2 users in this forum with 8x8 KAT 1 and 8m living boxes. Petra is about to build out her 8x8 and another user (Andreas) has a 8x8 with the former KTM racing box mounted. I just finished to write up all the wheelbases of the different models of special purpose vehicles of MAN (the X range) in a different thread. There is a third guy which i had been talking to by Phone living in Hamburg. He is maybe the closest in use to Augusto. He Has a blissbox on an 8x8 Kat 1 Without technical changes... Afaik...and uses the Truck for Familie traveling and as his Office. His reports about traveling the Balkan countries With an average of 38 Liters... Not going faster than 70...made my final decision for the 8x8. If you like maybe i can give you the contact. Btw ... there are uncounted comments on the consuption of these trucks. I guess the difference between the 8x8 and 6x6 - if driven not to fast and with the same weight to carry - is max. 10l/100. I dont think that this will decrease the action radius a lot. And bigger tanks dont cost a fortune. You did mention the more complex mechanix... compared to 6x6? which? it is the same car - only the stearing is double and a bit more complex to adjust... but.. how often is that nessesarry? Great information!!! Thank you very much, for sure we will be back very often to read again the information provided here for you about the versions vs overall view! In fact, the truck that I mention here https://home.mobile.de/CARAVANTRUCKSTRA ... _225048447 was inspected by a professional long time ago and we follow his advice, in any case the seller is and was very polite and even he proposed us another trucks, we really appreciated added that the seller also told us about an estimate cost price to the conversion to receive the living box! I hope the truck will be sold soon by a buyer able to work on it! but we just want some truck as much adapted as possible with a low cost for further conversions and work! Great links and the trucks from Sam & Andreas are pretty nice too. About the fifth wheel, I really do not think that would work for us.. so we prefer a chassis to build a normal expedition truck! Thank you for the suggestion. We were thinking all time "the newer the better" but based in the information about spare parts/price & availability, I will re think again it! I still feel that the better for us would be a 1999-2003 generation. 12m long... yes we know that it is a challenge but again, we are full active, 35 & 39 years old and we prefer to have enough space instead to lack of it with such an important and costly project! The only aspect that can make us think about the size is the possible incompatibility with standard streets and or small roads... in any case as I said, our, idea is not to go to the "old town European style", but to go to the isolated places, but of course we are aware that we will be even to cross all kind of road in any or other moment!!! Interesting what you say... Of course, to be in touch with the owner of the 8x8 crossing the Balkans would be great great and from the 1st hand to know about the "complexity of 8x8". I understand totally what you say about "complexity vs the really need to work on it" we have right now and from many years a big truck (American Style) with lots of comfort and complexity... but in the same way never ever we really had the need to work on it! So I agree with you about "when really we will need to deal with this complexity", as I said the 8x8 is and would be my dream, and my wife says that 6x6 or 8x8 is up to me! So I have this responsibility too, to choice the right one... full off road & the easiest possible to deal with. the owner of the 8x8 with bliss-box is Daniel, member "-dr-" in this forum. Some information you can find in the following thread: viewtopic.php?f=36&t=2481. To get into contact with Daniel you could send him a "PN" (Persönliche Nachricht), using this forum. Another direct contact and further informations you can find at the homepage of Daniel: http://www.supremacy.de/! the link you provided is from the car I talked about. There seems to be a serious issue with the hydraulic suspension system, as this car is on offer for a few years now and I know that quite a few people tried to find a solution to the suspension issue. Originally, I was interested in this car years ago (there are 2 on offer), but the hydraulic issue turned me away from these A1.1 - and I went for a version with normal spring coil suspension. Sorry, but my link with the wheelbase table I created was wrong - here is the correct link to the table. If you want to translate german speaking postings into english or your nativ language (just in case), you could use www.deepl.com for automatic translation - imho, currently the best translation service. Don't forget to discount approx 300cm for the the drivers cabin to calculate the max living cabin length available to you. Your country's legal requirements might differ, but I recommend that you check this first before selecting a car. Authorities in many countries are hesitant to allow longer cars than the manufacturer's recommendation - but as said, your country might differ. 2) increases the turning radius. Don't forget that both 8x8 types are already over the street legal limit of 25m diameter with 26,4 and 28,1m. Extending the wheelbase of the 8x8 will get you fast into 30m territory and I can only wish you well to get this approved. Andy points at a very important issue to think about. Making the 8x8 - despite legal issues - 12m long will reduce offroad abilities drastically. But this is only because the FM2 is sturdy and cheap. With a large and expensive box this is no option and I would rather stick to 10m! If all this is "nuts" to you and you would never go into this kind of terrain - maybe than a different (modern) truck is a better choice as you do not need a MAN KAT1 for gravel roads? I will se carefully the information about Daniel and yes, for sure I will be asking him more about the 8x8 truck, since in his website there are some long trips, so he will know important facts and aspects about the truck. What a coincidence about the truck, in fact I was almost to deposit when I knew that the truck was inspected long time ago by a professional and there were many issues due to the suspension... and yes there are 2 on sell... good luck to the buyer of this! Question??? In the case that we absolutely would like the 12m long... do you know what we need to do or the manufacturer to reach this approval? Yes, I thought about the disadvantages about the length, and is a factor that I still think about, I saw some videos when the trucks have a hard time dealing while turning, I can imagine the drivers sweating... I will consider this factor seriously! Even when we won't be the kind of "old European towns" travelers I understand that many times we will need to cross even when we are not really interested to visit this places. I was inspired in this UNICAT truck https://www.unicat.net/pdf/UNICAT-MXXL2 ... -en-es.pdf pag 10 (I am not counting the rear slide-out because in that case the truck goes from 12m to 13.5m long) https://www.unicat.net/en/info/MXXL24AH.php about the 12m length (I am not counting the rear and of course that we want as much interior space as possible. We will manufacture the truck in Germany and to register too, even when we think to be driving the truck mostly in non the EU we want to approve the German and EU laws in the case that in a future we would like to sell the truck or to change it. Also because the EU laws are the most strict so in the whole American continent there is no problem at all if the truck has European registration. Thank you and I will consider this aspect about the length. Once I saw that if the manufacturer is registed and if he approves the modification then the truck is approved... do you know something about? Zuletzt geändert von Lepatown am Di 26. Jun 2018, 03:44, insgesamt 1-mal geändert. any solution you want to have, has to be a compromise between competing requirements. When you talked about siginificant offroad capabilities and referred to the video from Congo, I would have never expected you to show us the Unicat XXL truck. Besides the fact that this truck costs more than a million Euro, it's offroad capabilities are rather in the category dirt-roads and light sand dunes. It's approach and departure angle, as well as the super low ramp angle between 2. and 3. axle as well as the low mounted soft materials used prohibit any serious offroad exercises without damaging the truck. The MAN KAT can go much more serious off-road tracks than the Unicat XXL. At the end, you and your wife have to decide where you want to go, how you want to live and how much to invest to reach both objectives. Life is a compromise. Sorry, I mixed up the price tag of the Unicat. It seems to be rather in the 3 million range and not 1 million when ordered new. I understand the 12m long vs the off road capabilities... adding that apparently the registration will allows less than 12 meters... My wife and I want the 12m because we will be living there, I mean full time, not just some weeks per year, also we will be working and traveling there too, but for sure we will see with the manufacturer about the registration vs the Man Kat model vs the allowed length! So we must to consider the independence about the diesel, tanks, off road capabilities (since we want to go to Alaska, Chile, Siberia, etc... we will be avoiding the EU, at least at the beginning but in any case we want to register in Germany). Thank you very much for the videos, the 1st & 2nd are great, is this one of your trucks or from a friend? First, congratulations for your truck! and yes, I can not imagine the XXL going into that roads, agree with you about the medium off road capabilities and yes, I know that the price was much more than 1 million, I thought 2 millions, the price is just crazy! We are considering all these factors as well, in any case we love the Man Kat and for sure even if at the end the truck would be dirty-roads or medium off road for sure it would be a Man Kat. We saw many modern trucks in the range of 30,000 to 45,000 euros but most of them have too much kilometers and we just preferred not to deal with electronics or too much modern complexity, thanks that we have an classic american car from 1964 full steel and 0 electronics and we have being driving it for long distances (2000 kilometers) without problem so we loved this way! The only factor that personally pushes me to the 6x6 is the possibility to add more diesel tanks... the manufacturer advice us the same, so we will be thinking about! and since the truck will have a living box the clearance would be just a little higher than the XXL. it would probably make sense to list your requirements in more explicit form, if you want further input. Otherwise we end up spending too much time on fireside chat discussions. The first is well known, but approx 4 meters short of your 12m requirement. The A1 8x8 in lime with the lifting living box. This would be my approach to "circle the square" on offroad capabilities, internal space, minimizing travel heigth and endurance. I think you are overemphasizing the complexity of the diesel tank. 1000lt is 1 cubicmeter, thats all it takes. Need 2000lt, put 2 tanks on the truck. The 4x4 with trailer is also an interesting "solution". It depends on the usage pattern of the 2 of you. Might be a hassle, or convenient. Augusto - If I am lucky I will do what Jstefan does one day... only with one additional axle. And I have thougth very very very long about the space needed to be happy on my journeys. I guess most of the trucks (I mean boxes) people actually LIVE in for years are in the 5,5 to 7m category. 7 Meters is allready a lot of space! I have built a 7x2,55x2,1m box in my living room (! ) just to get a feeling for the size. 7m is a good maximum size for 8x8 and 6x6 long wheel base. IMHO there is absolutely NO NEED to go from 7 to 8m (only 15% additional space) or 9m and reduce the terrain and destination options of the car by so much! maybe you try this yourself. buy some wood. and set up only the outlines of the box inside your home. thats good enough. you will be surprised! only by doing so you are free to go for the experience and joy only - even by risking to damage some material. if you hesitate all the time because you dont want to "scratch the valuable truck"... you might miss many of the advantures you were seeking when you initially started thinking about the whole project. Never. stay a low as possible. And build your box with roof slopes. stefans 3,70 would also just fit! KISS... ( keep it stupid simple ) should be on the top of your list. Otherwise you will build your problems on the road. We have 1500 liter of fuel capacity... nice to have, but no no need. At least for us in the past. If you use the space between the rear 2 Axels gives you 400 Liter extra... with 14.00... using the Frame as Tank could be also possible, but not recommended....due to korrocion. I’m not sure if a lifting roof does not generate more static and sealing problems... I decided not for us. Last not least: do not overestimate Unicat or the other “ high end players” they all cook with water... we saw and I worked on quite some of them during the trip...starting from broken boxes ( Robusto ) or broken box frame connections... a lot from exclusive stuff does not last long .... what does a Hutchinson Rim with de and inflate, help you if a Lokal Tyre guy kills the valve... by mounting wrong ... I could continue endless... realize KISS, is the best I could suggest you.